Since the end of the 1990s, the number of articles on coopetition—a relationship built on simultaneous competition and cooperation—has steadily increased in response to the growing prevalence of relationships of coopetition in many industries. 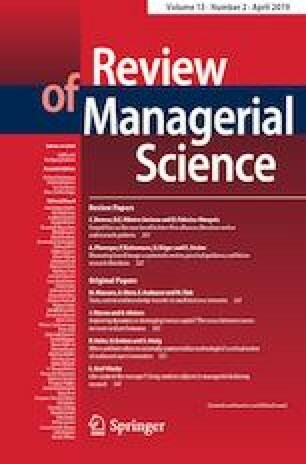 The tension inherent in a relationship of coopetition with a direct competitor presents both a challenge for managers and, at the same time, an exciting and complex research area. Different researchers of coopetition have addressed the topic from vastly different perspectives, basing their research on different theoretical frameworks, types of analysis, methods, and aims. By classifying articles on coopetition published in the last 20 years, this paper presents an application of cluster analysis to examine trends and tendencies in coopetition research. The paper also assesses whether this research field has followed a coherent progression during this period. The research reveals two independent research trends within the coopetition literature. The first research trend consists of studies that have mathematically modeled and simulated coopetition scenarios using game theory, whereas the second research stream consists of theoretical research describing the dynamics and tensions of coopetition based on evidence from case studies. Based on the cluster analysis, inter-firm alliances and their governance mechanisms emerge as the most promising theoretical and practical approach to improve cooperation between competitors.